You just don’t know what to do. It’s been a week where you’ve been bent over in your garden pulling out those nasty weeds. And there seems to be no end to these things. You enjoy gardening but you did not sign up for this tedious work of killing weeds. Is there a way out of this mess? Thanks to some brilliant people there definitely is. You can have a garden that is free of weeds without spending time and energy pulling them out. When would you need to dig up your soil? Why should you use weedless gardening? Are you ready to start weedless gardening? Weedless gardening is a method of gardening where you help the soil in your garden remain free of weeds without much effort. There are four main ideas that are the foundation of weedless gardening. The soil in your garden already contains a lot of weed seeds. It could be as much as 140 seeds for every pound of soil. So if you go about disrupting the soil by using a rototiller, plow, or by hand, guess what’s going to happen. The seeds are going to come to the surface where they get the light and air that they need to germinate. And you’re stuck with a big weed problem that is going to take some effort to resolve. So don’t think about tilling the soil because it’s not needed. When you plant a seed, seedling, shrub, or a tree just dig the required space and plant them keeping the disruption as minimal as possible. Weed seeds need light and air to survive. So the best thing you can do in your garden is to protect the surface of your soil and avoid giving weeds what they want. A good protective layer of mulch is needed in your garden. This will not allow the weeds to get the air and light they want and kill them. Mulch will help your plants get the moisture they need and keep the temperature well regulated as well. The type of mulch you will use depends on what is available to you, your garden soil, and the plants you have in your garden. It could be organic like grass clippings, inorganic like stones, or even live plants. The worst crime you can commit is moving about on the soil and compacting it. This limits the movement of air and moisture through the soil. So don’t use the rototiller, garden tractor, or wheelbarrow on your planting soil because you don’t need to. Keep a separate space for traffic and for growing your plants. The amount of space you need for traffic depends on your garden and what is going to be part of that traffic. Weeds need air and sunlight to start germinating. But they also need water to survive. And the worst thing you can do is to water the unwanted parts of your garden where such weeds will spring up. Instead, a system like a drip irrigation is useful because it waters the precise spot of the plant that needs watering and avoids unwanted areas. It also provides the plants with the right amount of water based on their needs. There are some special situations when you might need to dig up the soil or change the composition before you can start weedless gardening. But this is just a one-time procedure and you won’t have to worry about doing it again. Plants and essential microorganisms need the right acid balance in the soil so they can take the nutrients from the soil. If the soil is too acidic most plants will not be able to survive though there are some that will. The acid level in the soil is measured with the pH level. This can be tested by your Local Extension Service or using a simple soil test. The pH level of 1 indicates that the soil is most acidic while the pH level of 14 indicates the soil is most alkaline. Most plants like to grow in a slightly acidic soil that has a pH level between 6 and 7. There are some plants like blueberries that like to grow in more acidic soil. If your soil is too acidic or alkaline based on the soil test, you will need to improve it. You can add limestone to lower the acid levels in the soil or you can add sulfur to increase it. However, these materials take a long time to change the pH levels of the soil if you just put them on the top. To change the pH levels faster you will need to dig these materials into 6 to 12 inches of the soil. Your garden bed might be sitting on top of bedrock that will not allow your plants to grow. You will need to create a raised bed where you can add a mixture of good topsoil and compost to create a fertile bed. It might be that your soil contains a lot of clay that does not allow water to drain well. Clay tends to get sticky the more water you add to it and it becomes hard when there is no water. You can check the drainage of your soil by digging a 1-foot hole and putting water in it. If the water takes more than a day to drain out then the drainage is not good. If there is just a little bit of clay you will be able to change the composition by adding a layer of compost on top of the soil which will gradually sink in. However, if the clay is too dense and not allowing water to drain well you will need to dig the compost into the soil to improve it. Hardpan is the layer of soil that becomes hard due to compacting. This could be because of traffic on the soil such as people, mowers, or rototillers. Such a layer will not allow water to drain well through the soil. It will also prevent roots of plants from digging into the soil. You will need to dig into the soil and break down this hardpan layer before you can start planting in such soil. There are several benefits you can get using weedless gardening and not turning the hell out of your garden soil. Wouldn’t you like to do less work in your garden and reap the benefits? With weedless gardening, you don’t have to turn the soil using a rototiller, plow, or by hand. You save yourself the time and effort and even money if you hire people to do this work for you. You may be turning your soil in spring to create a new garden, to kill the weeds, or mix the cover crops in your garden. The problem with doing this is the bacteria and fungi in the soil get a lot of aeration and spring into intense activity for a couple of weeks. There is no way you can plant during this time and you need to wait a couple of weeks or more. With weedless gardening, you don’t need to waste your time waiting for the right moment to plant. You just plant the seeds or seedlings when you’re ready and when the weather is right. Spring is the activity for plants and organisms where roots grow into the soil, organisms move about in the soil, and the frozen soil gets thawed. When you leave the soil untouched this creates a channel of pores in the soil that makes it easy for air and water to travel through them. Most of the water will move deep into the soil due to the effect of gravity where it will be taken in by the roots. But there will also be small capillaries that will help the water move sideways as well as upwards and reach even the smaller roots. The surface of your garden soil plays an important role to help distribute water to the plants. As you water the plants or during rainfall, the organic material on the surface of the soil helps soften the flow of water. The organic material on the soil also helps act as a mulch that protects the soil from the sun’s heat and the cold temperature. It helps to retain the moisture in the soil and prevents it from evaporating too fast. Compost is an essential part of your soil that helps provide the organic matter needed by the microorganisms in the soil. If you till the soil, the compost will break down very fast before you can replenish it back and the microorganisms will begin starving. This will not provide your plants with the nutrients that they need. But if you leave the soil undisturbed the compost on the soil will be broken down at a slow rate by the essential microorganisms and provide a constant supply of nutrients for your plants. It’s really quite easy and fast when you want to start your garden with weedless gardening. All you need to do is mow down existing plants and weeds, add a little bit of fertilizer, cover the ground with newspaper, and then add a layer of organic material. Of course, you might need to do a little bit more work depending on the condition of your soil. If it is too wet, too rocky, or acidic you will need to take the corresponding action. If you don’t have any of the above problems then your garden will be up and running within a day or so. If you’re lucky you already have a patch in your garden that is free from any kind of plants or weeds. But in most cases, there will be some sort of plants growing there. Maybe it is grass, weeds, or some plants you have previously planted. Now is the time to get rid of all these plants by using your boots or a mower to stomp them flat into the ground. If you can cut them up with a power mower even better because the plants will decompose faster. You should also consider adding some fertilizer when starting your garden. Any complete fertilizer will do as long as it contains 5 percent nitrogen. The plants that you stomped into the ground are still alive because they have their roots in the soil. So you need to kill them off before they can sprout new stems and leaves. The way to do this is to use a thick blanket of newspaper to cover up the garden patch. This will prevent air and light to reach the plants and slowly kill them. A 4-inch layer of newspaper should be sufficient to do the job. You should wet the newspaper so that it stays in place. Also, make sure that the newspaper is free from color inks and dyes that could be harmful to the plants. Because the newspaper will decompose along with the killed plants and provide the soil with rich organic matter. Now that you’ve stomped the plants, added fertilizer and covered the ground with newspaper you need to add some mulch on top. This mulch will prevent the newspaper layer from flying away due to the wind as well as provide a protective layer for the soil. The mulch will keep the temperature in the soil regulated so that it is neither too hot nor too cold. It will also protect the roots from strong winds. The mulch will provide good aeration to the roots as well as sufficient moisture to them. It also helps retain moisture that would have otherwise evaporated quickly. Mulching will also protect water from splashing on to the foliage as you water your garden. And this helps to prevent several foliar diseases that could damage the plants. You need to add about 3-4 inches of mulch for it to be effective. This will also prevent the seeds and seedlings from making holes in the newspaper layer as you plant them. Before applying the mulch divide the garden areas into paths and beds. You can then apply a different mulch to the paths and beds so they are easy to differentiate. The type of mulch you apply depends on what you have available as well as the environment of your garden. For your paths, you have the option to use permanent mulch such as gravel, crushed oyster shells, or even bricks. 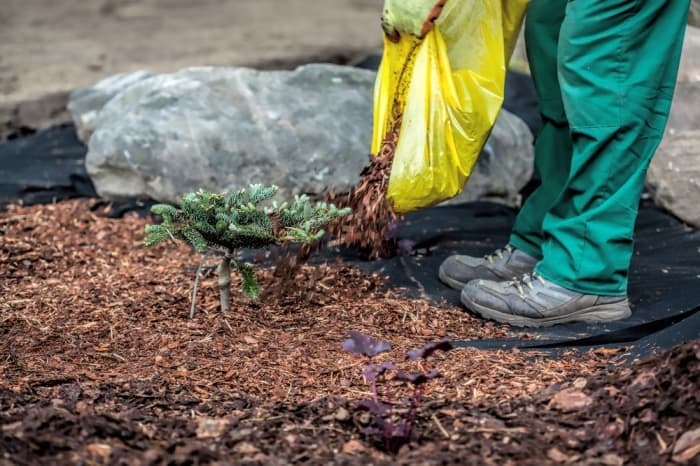 You could also consider organic mulch options like sawdust, grass clippings, wood chips, leaves, pine needles, or even compost. You can also use any of these organic mulch options in your garden beds. Though you’ll need to replenish them every year as they will decompose and provide nutrients to your plants. The edges of your garden make it look aesthetically pleasing to the eye. However, the weeds have a tendency to cross the edges and attack your garden bed. Especially weeds that are nutrient hungry and aggressive. The best thing you can do is to reduce the number of garden edges you have. So instead of having a lot of separate garden beds, you could consider combining them into as few as possible. If you observe weeds trying to cross the edge, you could simply pluck them out by hand and be done. You could also use a hoe or a mower to chop off the weeds mower to chop off the weeds. If you don’t want to do a lot of maintenance you can consider creating a boundary using things like bricks or stone blocks. This will prevent the weeds from crossing the edges but you do need to check them every few weeks and remove any weeds trying to cross them. You could also use plastic or metal to create such boundaries but you need to stick them into the ground and they might come off due to the freezing and thawing effect. If you have a raised garden bed then such a boundary will make it even more difficult for weeds to cross over because they have to climb over it. You could even use a thick layer of plants like wormwood around the edges of your garden bed. Such plants won’t allow competing plants including weeds to grow through them. You do need to be careful to prevent these plants from acting like weeds themselves. The advantage of weedless gardening is that you will require minimal effort in maintaining it. 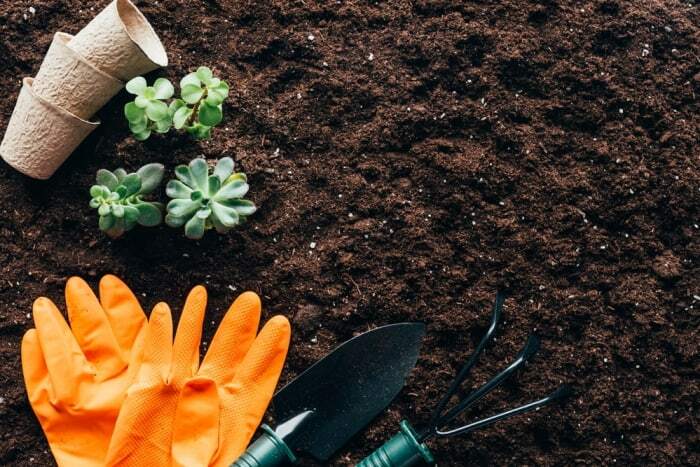 Of course, you do need to do some occasional maintenance work such as cleaning up, mulching the soil, planting cover plants and removing the few weeds that may sprout. You may not need to do all of these things and it entirely depends on your garden, the plants they contain, and how you garden those plants. Your garden requires the occasional cleaning especially in winter when the plants have withered or turned black due to the frost. You need to take away the stalk and the small roots of such plants but be careful not to dig up the large roots because that will take away some of the soil attached to them. You can pull at the stalk of the plants and with a garden knife cut the stalk and the small roots. What roots remain in the soil will die out in winter and provide nutrients to the soil. They will also provide channels for water and air to the new plants you will be planting next season. An additional benefit of cleaning up your garden from dead plants is to protect your garden. Some pests and diseases nest in the dead stalks and roots of plants during winter and attack the new plants in the next growing season. By removing such dead plants you also take away such pests and diseases and protect plants in your next growing season. Bare ground is going to end up with some trouble. Either weeds will start growing on this ground or it will become unsuitable for growing plants. As rain falls on the bare ground it blocks the pores and prevents good drainage. This will cause the rain to create gullies with the erosion of soil. Bare ground is also subjected to the heat from the sun as well as the cold temperature during winter and makes it unfit for plants. The best thing you can do for your garden is to add a layer of mulch to it. This will prevent the weeds from growing in your garden because the mulch will suffocate the seeds. It will soften the fall of rain and allow it sufficient space to drain through the soil while retaining the moisture. A good layer of mulch will keep the temperature of the soil regulated protecting it from the harsh sun as well as the frost. You can add 1-2 inches of mulch as soon as you find the garden is getting bare and you can see the surface of the soil. For the garden paths, you can use inorganic materials like stones or bricks that act as a mulch and don’t need to be replenished often. For the garden beds, it’s better to use organic mulch like leaves, grass clippings, sawdust, or wood chips that will not only protect the soil but also provide rich organic matter once they start decomposing. If you use an organic material as mulch you do need to replenish it depending on how fast it decomposes. This may happen fast if you live in a climate that is hot and gets plenty of sun. Some people think adding mulch like grass clippings or sawdust depletes the nitrogen from the soil and the plants won’t be able to get the nitrogen. While it is true that microorganisms need more nitrogen to break down such materials they do provide the nitrogen to the soil as well. The rate of breaking down such material is quite slower than the rate of replenishing it. So it should not be a reason for worry. Cover crops are plants that are specially grown to protect your garden from weeds and enrich the soil. The cover plants include various kinds of grass or legumes such as rye, oats, or barley. These plants have long roots that are beneficial to enrich the soil. The plants also release a chemical that deters weeds from growing. You need to time the plants well and grow them in a season like fall where your garden is going in a hibernate state. This will not allow weeds to grow in the garden. The long roots of such cover plants pull up nutrients and minerals from the soil and will later be used to enrich the top layers of the soil for your growing plants. Once spring arrives and the garden is ready for planting you need to kill these cover plants. This will provide a protective layer on the soil that will suffocate the small weed seeds and release chemicals that will deter weeds from growing. The decomposing cover plants will also provide rich organic matter to the soil that will benefit the plants you are growing. Once the large roots of the cover plants like oats or rye are dead they provide channels for air, water, and newer roots. You do need to take care and kill the plants before they go to flower. You can do this by using a grass shear if your garden is small. Or you can use a mower if your garden is big. With weedless gardening, you will be surprised at how little effort is needed to take out weeds from your garden. Yes, even with weedless gardening you will have the occasional weeds in your garden beds or paths that you need to take out. The weeds may arrive in your garden either in the wind, water, as part of your compost or through the edges. They may even be dropped by animals and birds or even arrive sticking to the bottom of your shoes. You just need to have an occasional stroll through the garden every week or so and check for any weed plants. It will not take you more than a few minutes to clean up such weed plants from your garden thanks to weedless gardening. Most of the weed plants will be small and you should be able to just pluck them out of the soil and put in your compost pile. If the weed plants have grown too big you need to cut them at the lower part of the stem along with the fine roots. You need to take out the big roots carefully without disturbing the soil to remove the plant completely. If you have a big garden then the best thing you can do is to cut down the weeds with a mower and then put some mulch on top so that they suffocate under it. If you have weeds on your garden paths they will tend to be the small plants and you can just pluck them with your hand. You could even consider a regular application of a herbicide or hot water to keep the area free from weeds. If you’re lucky a layer of good mulch will be sufficient for your plants to continue growing every year. But if not you may need to provide them something they need such as fertilizer, compost, nutrients, and irrigation. This entirely depends on the type of soil you have, whether it is rich in nutrients or deprived of it, what is the climate in your garden, how hot it gets and dries out the water as well as nutrients from the soil. The best thing you can do to realize this is to take a look at your plants as they will show signs of what the soil is lacking in. You may see fertilizers available with some numbers printed on them such as 5-10-5 also known as the NPK. This means the fertilizer contains 5% nitrogen, 10% phosphorus, and 5% potassium. If you have taken care of using a good organic mulch like compost in your weedless garden, the soil will naturally contain the nutrients that are needed by plants and microorganisms. You don’t have any need for adding additional fertilizer to it. The compost breaks down slowly in the soil providing the microorganisms the necessary food they need. These microorganisms, in turn, break down the nutrients and minerals in the soil so that the plants can absorb them. You do need to watch your plants if they show any signs of a lack of nutrients. This may be visible as wilting or faded color of the leaves and stem or rotting of the fruits and vegetables. If you had a garden where the acid balance was out of control and you had added lime or sulfur before starting the weedless gardening, you may need to keep adding it every year based on the soil test you conduct. It may also be that the nutrients are washed out of the soil due to heavy rains or because harvesting the vegetables is taking out some parts of the soil. If you notice your plants showing signs of trouble first check if there are any insects, viruses or fungi that are causing this problem. Otherwise, you could get your soil tested for lack of nutrients. If really needed you can then consider buying an organic or synthetic fertilizer based on which you feel comfortable with. Organic fertilizers like manure, vegetable waste need more time to mix into the soil than synthetic fertilizers. However, they provide a slow release of nutrients that are beneficial to plants over the long term. With weedless gardening, a lot of the problems like soil acid levels and nutrient loss should not be a problem as long as you keep providing good organic matter like compost to the top of the soil. Compost is the rich organic material that is dark, crumbly and gives off a sweet earthy smell. The more your soil has this rich material the better it will be for the growth of your plants. It is a mixture of several materials that provides a combination of essential nutrients that plants need. Adding compost as a mulch in your garden will prevent weeds from sprouting. It will also keep the soil moist and cool for the plants allowing water to percolate through the pores and reach the roots and microorganisms. Adding a 1-inch layer of good compost to the top of your weedless garden will provide sufficient food for the plants and microorganisms. If you have the time and inclination you can make your own compost. If not you can just buy some from local producers. It’s better to not buy the compost from the garden supply stores because it is sterilized and the microorganisms in it are dead. Instead, check the Yellow Pages and find local suppliers who make the compost from waste and will supply them to you. You do need to be careful when buying compost to check that it is fully composted and not mixed up with soil. You should also find out about the source of the compost because the more varied the material used the better will the compost be. 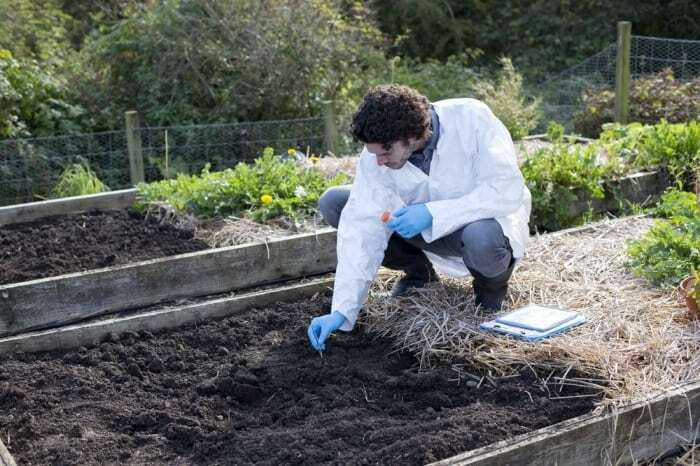 Also, try to find out the process used for making the compost because there might be hazardous industrial waste or weeds in the compost and you don’t want to use that especially for vegetable gardening. You cannot fail if you try to make your own compost because the organic material will eventually decompose and you will get the dark rich material. 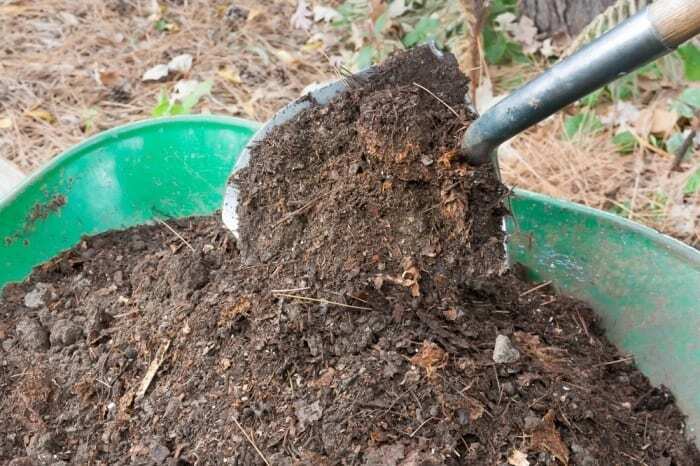 It’s best if you make the compost using a range of organic material because then it will contain all the essential nutrients that the plants need. To make compost you need to gather such organic material and then provide sufficient air, water, and food to the organisms in it to thrive and decompose the material into compost. You can either make a compost pile or use a compost bin to start creating your own compost. It’s better to keep the location as close as possible to the area from where you can dump organic material into it and take material out for use. You could even create the compost pile on top of the garden bed where you intend to later plant. Make sure the compost pile is of the required height and not more so that the air circulation in it is good. You will need to provide water to the compost pile especially if there is not much rainwater available. The food for your compost pile is the organic material you need to keep adding to it. You should consider adding such material in layers alternating between layers rich in carbon and nitrogen. Material such as grass clippings, green vegetable matter is rich in nitrogen while material like dry leaves, wood chippings are rich in carbon. You don’t need to worry too much about the quantity of the materials you add as long as you add a variety of organic materials that break down easily. Some people worry about adding diseased or damaged plants to the compost pile but there is nothing to worry about as long as the compost pile reaches a high enough temperature during decomposition. The microorganisms in the compost pile will decompose the material and generate a lot of heat. This should be sufficient to kill most of the pests, diseases, and weed seeds if any in the pile. If your compost pile is not reaching the required temperatures and decomposing is slow you need to adjust the air, moisture, and food supply based on what is lacking. If your compost pile starts to smell it means there is not sufficient air and too much moisture due to which anaerobic bacteria are decomposing the material and creating a stench. If that is the case you will need to turn the compost pile allowing sufficient aeration for a few days. Once your compost is almost ready it will not generate a lot of heat and turn into a dark crumbly texture which you can then use for your weedless garden. You can use the traditional method of watering your garden with a hose or a sprinkler but that turns out to be wasteful. When you water the plants in such a manner you provide an excess of water that takes time to percolate into the ground based on gravity. The plant roots can breathe easy and use the water only after the excess water has drained. The excess water drainage also means that a lot of the water is wasted instead of being used by the plants and microorganisms. A better option for your weedless garden is to make use of a drip irrigation system for the watering. This system works well with weedless gardening because you can place the drip emitters in the soil and not worry about damaging them because there is no tilling to be done. With such a system you can control how much and how often your plants receive the water. The water is precisely directed towards the roots of the plants which minimizes wastage. The water also does not go to the unwanted areas of the garden bed where it could lead to the development of weed plants. The drip irrigation will also prevent water from splashing on to the foliage and prevent a lot of the foliar diseases caused due to the infected soil. You can also control the amount of water you provide with your drip irrigation either manually or automatically controlled. If there is a lot of rainfall you could lower the amount of water being injected by the drip irrigation system or turn it off for a certain amount of time. And in days when the weather is especially hot, you can consider keeping the drip irrigation running for a longer period of time to provide your plants with the additional moisture they need. Now you know how to put an end to the weed problems in your garden. No more spending hours picking weeds, dripping buckets of sweat, and worrying if you got all of them. It’s time to enjoy your garden without worrying about it.